Claude Monet's The Luncheon, painted around 1874, is one of the last large-scale works the artist made, having previously worked almost exclusively in this scale, before turning to the small, tightly constricted frame that consolidated the Impressionist style. It is early afternoon, the ethereal light bathes the quiet bourgeoisie garden in a warm glow. Cast upon the ground are the countless interwoven shadows from the shaking foliage and filigree of the natural surroundings. Having just finished their lunch, the family linger around the detritus of the meal, as the light changes around them. They remain a constant, anchored in Monet's domestic reality, as the world shifts and turns around them. Within this broad frame one can see members of the young painter's family. Indeed, the title of the work does not accurately describe the scene as the meal is long over. Instead, the title refers to the ritual of lunch, the daily ceremony of joining together in tranquility and familial unity. The changing impressions of light, captured and depicted at intervals to articulate the nature of its impermanence. 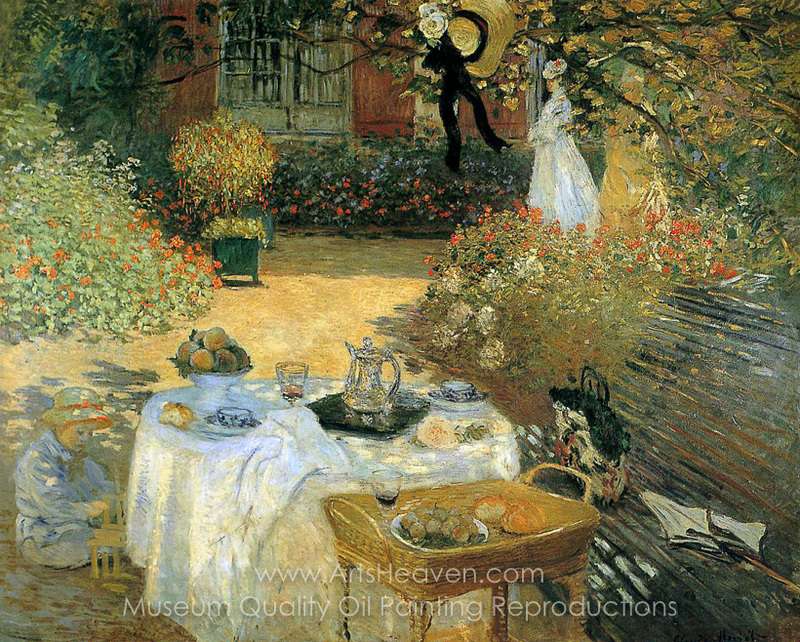 A signal of the prodigious talent of the father of Impressionism is the artist's depiction of the whiteness of the clothing and the tablecloth. When studying the texture and colour of the finery one realises that the artist articulates the character of the white shade through a blend of blue and pink. It is also possible to see the manifestations of early Impressionism in the vague and ambiguous shapes of the objects depicted, that do not achieve visual verisimilitude until one steps back from the canvas. This banal scene, articulated and rendered with such loving precision and ambition, represented a seismic shift in European cultural life, when painters turned away from the depiction of historical events, major scenes and battles, and classical visions, and towards the subtle rhythms of the everyday. Like his iconic work of the previous year, Impression Sunrise, Monet's The Luncheon is a formative moment in the history of Impressionism wherein one can detect the artist's unrestrained desire to represent the fleeting movements and moments of life, summed up in the rhythms of changing light, natural vegetation, and family unity. Monet's snatched glimpses of utopia are transitory and precarious encounters with a time rapidly passing by. Despite the fame Monet would find in later years, the years following The Luncheon were marked by critical derision, financial hardship, and torment. This moment captured is a respite from the tribulations of the world outside the frame. 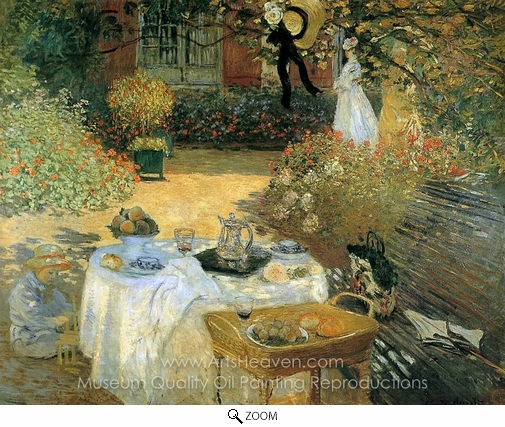 Decorate your home or office with our beautiful museum quality art reproduction of Claude Monet The Luncheon painting. Why settle for a print, poster, giclee or canvas transfer when you can grace your walls with a genuine oil on canvas painting reproductions for sale at up to 75% below gallery prices. You are commissioning an authentic hand-painted oil painting on quality artists canvas. Painted by professional artists brushstroke-by-brushstroke with attention to all details. Order your Masterpiece today and get Free Shipping to your door direct from our studio.